EurekaLog is the new add-in tool that gives your application (GUI, Console, Web, etc.) the ability to catch all exceptions and memory leaks, and generate a detailed log of the call stack with unit, class, method and line-number information as shown in the image below. The information shown is also logged to a disk file and may optionally be forwarded to you by e-mail or via Web (HTTP/S - FTP). EurekaLog helps you find infinite loops and deadlock bugs, raising an exception when the application is frozen for a specified time. The exception shows the same application state as it does for other exceptions. EurekaLog is easy to use because it is fully integrated into the Delphi/C++Builder IDE. 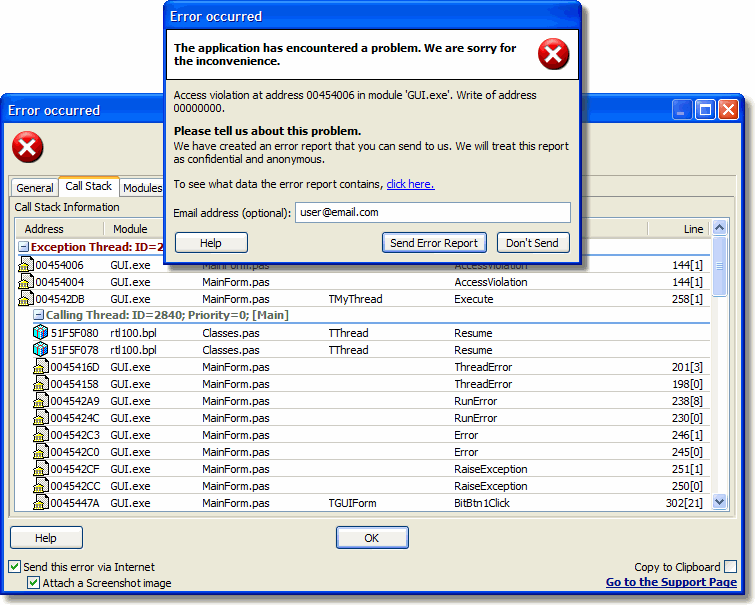 You just rebuild your application to add this new exception-logging capability. EurekaLog does not affect the performance of your application, as it only executes when an exception is raised. It increases the compiled file size by about 0.5% - 4% (this space is needed to store some additional, compressed and encoded, debugging information). To works EurekaLog needs only of the compiled file (not .map file). EurekaLog is compatible with Delphi 3, 4, 5, 6, 7, 2005, 2006, 2007, 2010 and XE, and with C++Builder 5, 6, 2006, 2007, 2010 and XE. It works on all Windows platforms, from Windows 95 to Windows 7. It comes with full source (only Enterprise version), full money back guarantee, is royalty free, and freely updatable! Don't waste anymore time and money debugging your applications: now EurekaLog debugs them for you. See "features" topic for further details. A typical example of EurekaLog dialog.